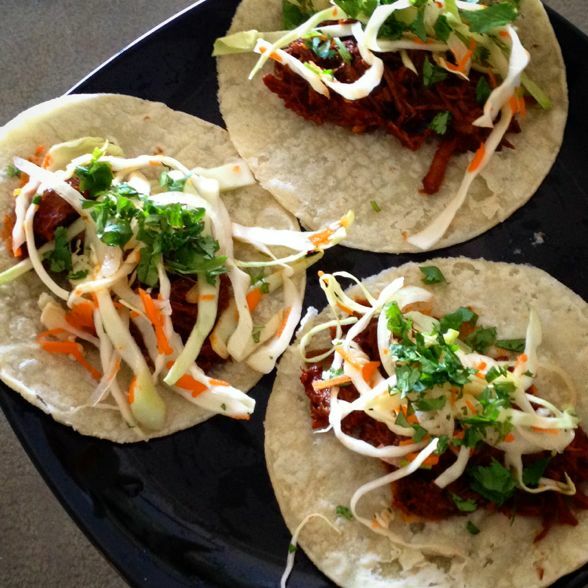 There’s no shortage of tacos in Los Angeles, except for maybe in Little Armenia, but who am I kidding? There are tacos there too. Tacos are everywhere in Los Angeles. I mean er’rywhere. 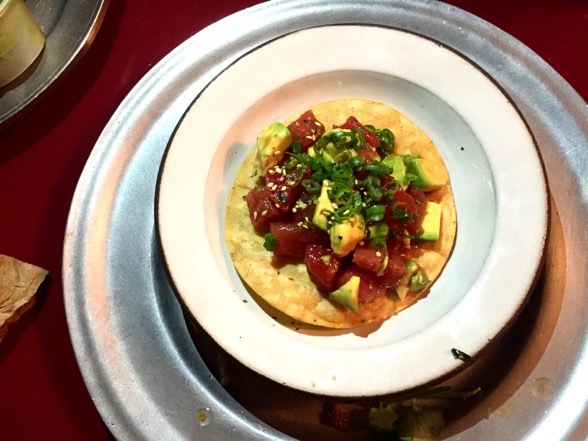 Yes, tacos and L.A. go together like pizza and New York, chowder and Boston, Outback and Orange County — classic combinations that won’t be going away anytime soon. As I mentioned earlier today, one of my favorite tacos in Los Angeles is the carne deshebrada from Lotería Grill. I have consumed many of these garlicky, beefy concoctions (often in burrito form too) for years now, and all the while, I have wondered how I could recreate the magic in my lil’ home kitchen. To be fair, I did once try my hand at the elusive deshebrada, but it was a middling failure (see pictures of the whole affair from my younger, slimmer days here). 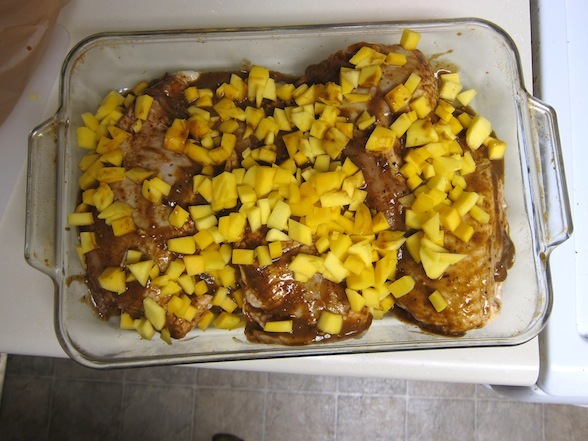 Of course, that was 2010, and all I had to guide my naive self was a random Internet recipe from Epicurious. Nowadays, I’m older, wiser, and more importantly, equipped with a subscription to Cook’s Illustrated (thanks, Mom!). Naturally, when I saw that this detail-oriented cooking mag had its very own carne deshebrada recipe, I knew I had to give it a whirl. It’s been a second since I last posted a recipe from Rick Bayless’s Mexican Everyday, but that doesn’t mean I haven’t been cooking from the book. In fact, I have been doing a lot of cooking over the past month or so, but I’ve simply been too lazy to post it here on the blog. Well, enough is enough! I’m going to get back in the Adventures in Domesticity zone and try to work through this crazy backlog of photos I’ve taken. Seriously, it’s stressing me out. I need to get this stuff up on the blog. How do you solve a problem like tomatillos? Make salsa! In my case, I had about five, sad tomatillos sitting in my crisper, quietly veering toward death. I couldn’t let such a wretched fate befall my green pals; so I recruited them to service via my trusty Spring cookbook, Mexican Everyday by Rick Bayless. I quickly found a recipe I could make with the ingredients I had on hand — Toasty Guajillo Chile Salsa — and got to work. I’m a little concerned that over five hours have passed since I’ve posted something pertaining to Mexican Everyday, but don’t worry: I’m back with yet another Rick Bayless adventure. 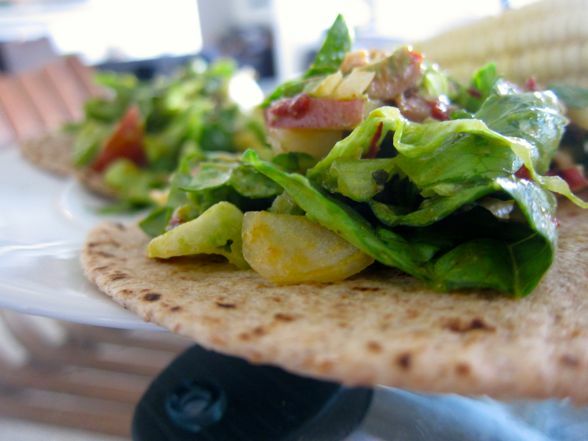 This time around I’m tackling “Chipotle Chicken Salad Tacos with Avocado, Red-Skin Potatoes, and Romaine.” Basically, it’s salad in a tortilla. I selected this dish mainly because a) I had chicken in my freezer, b) it’s big and can stretch over several meals, and c) despite its appearance, it’s not all that unhealthy. 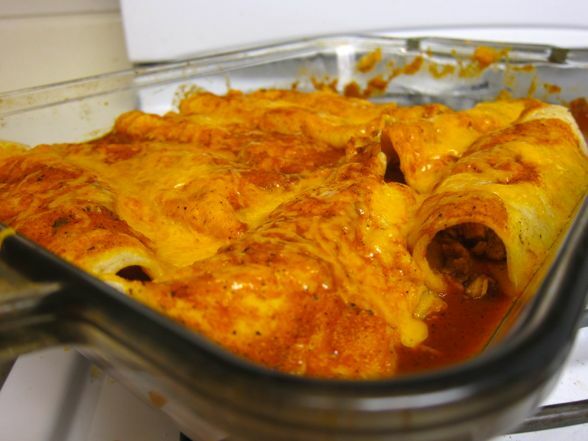 Besides, with Cinco De Mayo right around the corner, why not whip up a batch of enchiladas? It’s only prudent. It’s been a few days since I last posted anything pertaining to Rick Bayless’s Mexican Everyday, and that simply won’t do. Thus, here I am again with yet another Adventure in Domesticity based off a recipe from this handy dandy cookbook. 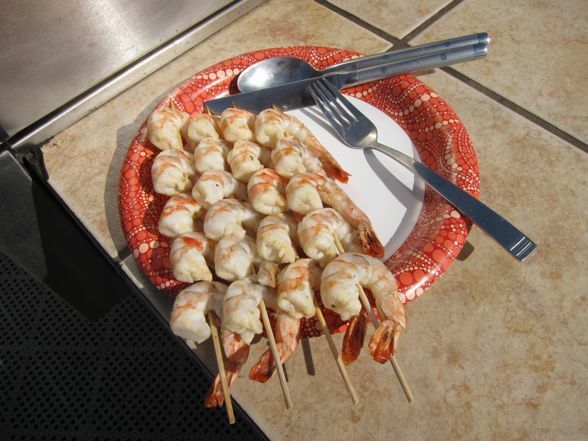 This latest experiment came from a sudden desire to have grilled shrimp for lunch. Bayless recommends using his garlic lime marinade for such an occasion, and who am I to resist? 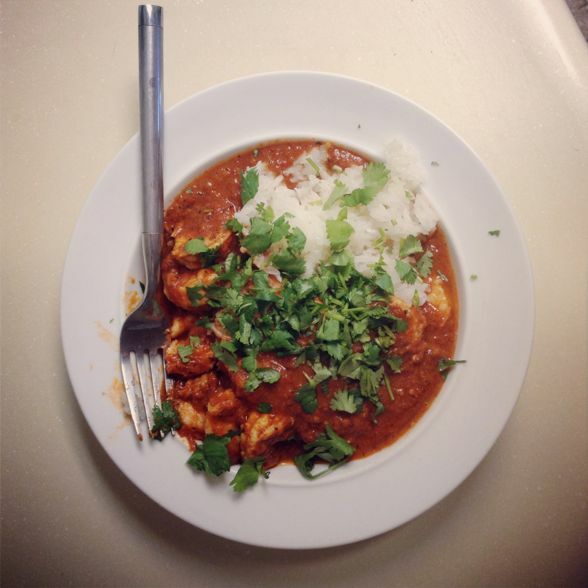 Ever since I bought Madhur Jaffrey’s Indian Cooking in 2011, I’ve been babbling to whomever would listen (usually no one) about how similar Indian and Mexican cuisines are. 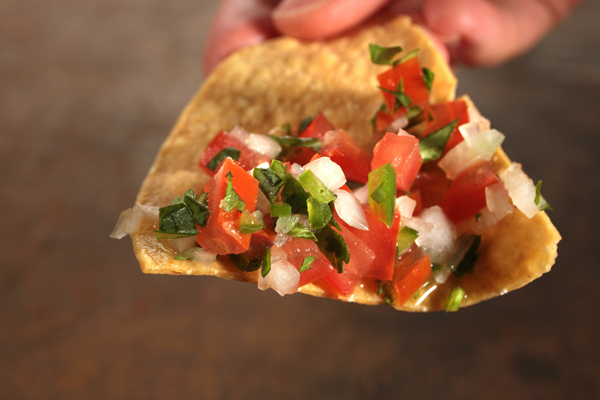 Both use large amounts of tomatoes, cilantros, onions, chiles, garlic, and cumin. And yet, the flavors could not be more divergent. It makes sense, really: the countries are 9,100 miles apart. There’s no good reason for them to have any similarities. A perfect example of how the same ingredients, with just a few tweaks, can yield such massively different flavors is Mexican pico de gallo and Indian cachumber (or kachumber). The former is considered a salsa, the latter a relish. Each have seven ingredients total, but by simply swapping out three simple items, we can go from Mexico to India and vice versa. (Listen, maybe if you were stoned, you’d find this as cool as I do). Well, ladies and gentlemen, here I am with my fourth Rick Bayless recipe from his book, Mexican Everyday. 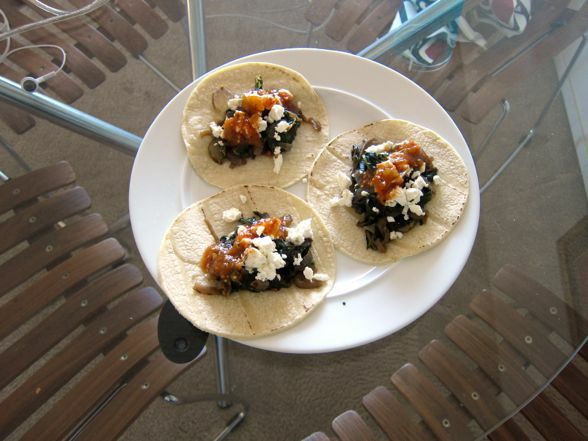 I suppose one of the advantages of an “everyday” cookbook is that you can truly cook from it everyday without it being a “thing.” That’s why I was more than happy to take on this double-recipe: Swiss chard tacos with caramelized onions and feta as well as a chipotle salsa ditty on the side. The journey through Mexican Everyday continues. Yes, I am here with my third Adventure in Domesticity in about a week’s time, and I’m continuing my journey through Rick Bayless’s aforementioned cookbook. For those keeping track at home, the results have been largely positive, save for the Pollo Pulquero dish which I evidently screwed up (and erroneously blamed on the recipe). Nevertheless, even as a miss, the Pollo Pulquero was still pretty good, and let’s not even talk about the Avocado and Mango salad that I made earlier this week. I whipped it up again today with leftover ingredients from the first go around (ie. the bacon, pepitas, dressing, etc), and I swear, it’s a big time winner. Nevertheless, after having sampled Mexican Everyday’s chicken and salad recipes, I was eager to move on to seafood. My motivations were twofold. Or perhaps threefold. Many folds were had. First, I wanted to make a shrimp dish because, well, I love shrimp. Second, shrimp is a healthy option. Third, I had just bought a deveiner that I was eager to test out. And thus I recruited my dear friend Sly to take pictures of me as I tackled both this latest Bayless recipe as well as my new kitchen gadget. Pics after the jump. Just a warning, what you are about to see includes graphic images of both deveined shrimp and my messy kitchen.